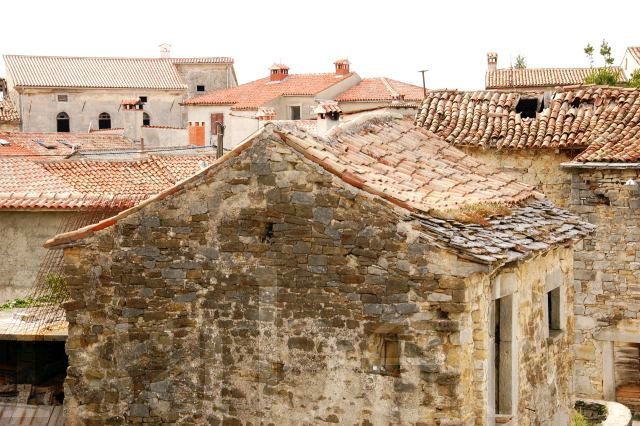 Istria Outside My Window: Why are so many houses in Istria abandoned? Why are so many houses in Istria abandoned? Why are so many houses in Istria derelict and abandoned? This is a question I get asked by lots of visitors to the village. In Gračišće, and many other villages all over the Istrian peninsula, many of the stone houses are in a bad state of disrepair and are literally falling apart. Probably more than half of the houses here in this village are abandoned and uninhabited, and slowly collapsing. It’s a sad state of affairs, that’s why so many visitors who are enchanted by this small medieval village wonder how the old houses can be allowed to just crumble away and why initiatives aren’t being taken to restore them. 1. Locals don’t want to live in an ‘old’ house. I would be rich if I got a kuna from every person who said to me: “Why are you renovating an old house? Why don’t you build a new one?” Unfortunately few people value these old houses made of ancient stones. Maybe this is because they represent the past, and the poverty of the past. People today want to build their own brand-new house, made of bricks and with all the modern fixings. In a region with such a low population-density like Istria, there is certainly lots of land available, and many people who can afford to build a house would much rather do this than restore an old crumbling one. 2. Their owners live abroad. Some of the houses in the village were abandoned sixty or seventy years ago when their owners emigrated to faraway lands in North America, Australia, and South America. Some of them never came back, not even for a visit. Their houses are still here and if someone wants to buy their property, they would have to first identify who the owners are and try to contact them, not an easy prospect. 3. A property often has many owners. This is a huge bureaucratic problem in Croatia and something which puts off a lot of people from buying or selling a property here. Property titles often have over a dozen co-owners listed because homes automatically get handed down from one generation to the next. Maybe some of the owners live abroad, or are deceased, and the properties keep getting passed down to their next of kin. If one of the owners wants to sell the property, he or she has to get the agreement of all the other co-owners. If one disagrees, then it’s a no go. 4. The ownership of a house is disputed. I can think of several houses in the village that have been rotting away while waiting for a decision to be taken on its ownership. The Salamon Palace is one. A decision has to be taken by a court – this takes years. 5. People are too sentimental to sell. There are many houses which are sitting empty and abandoned simply because their owners do not want to invest in their upkeep and do not want to sell either. People have strong attachments to their family homes, which often housed generations of the same family, and wouldn’t dream of selling what they consider their heirloom. They’d much rather let the family home rot rather than give it away to someone else. The old family home ends up becoming something of a museum piece, a relic of the past. These are the main reasons why many of Istria’s villages have been derelict for years, and though things are changing, the change is slow in coming. This is part of the reason why we wanted to renovate a house in Gračišće – so that the village gets a breath of new life. And it is, but very slowly. Taking on a house renovation project here is quite the undertaking, and you have to have the motivation (and patience!) to do it. Most of the houses here in the village which have been renovated in the past ten years or so, have been converted into tourist accommodation by locals who inherited or bought a property, and hope to have a return on investment by renting to tourists during the summer. There are also a few foreigners or mixed Croatian-foreign couples and families who have done the same, and use the property as their holiday home. As a result of this trend, some Istrian villages have become virtual ‘ghost towns’, only coming alive during the summer months. Of course Istria and other parts of Croatia are not the only places experiencing this phenomenon of ancient villages becoming derelict and abandoned. But in some villages in Italy and Spain, action is being taken to given such places a new lease on life. Have you heard of the village in central Italy where houses are on sale for €1? There’s also a 15th-century hamlet in northern Spain which is being given away for free!